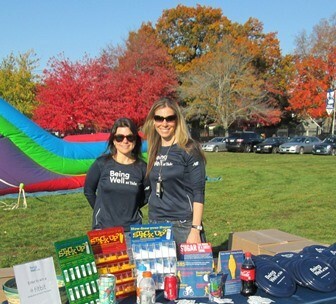 As Yale’s new employee wellness program, Being Well at Yale was proud to be one of the tables at the annual Employee Day event. Thank you to the Office of Public Affairs and Communication for inviting us! Over 1,500 employees, retirees, children and guests were a part of this great event! Not to mention all the wonderful staff who gave their time. Being Well at Yale gave away over 800 Frisbees! Some of the children had never seen a Frisbee before and were delighted when they learned how to use it! Kids and parents alike were having fun tossing them around in the open field outside of the Yale Bowl. Many visitors, both adults and children, were intrigued by our “Hidden Sugar, Salt and Fat” displays. Several parents made it a point to bring their children to our table to show them the displays, saying that showing how many packets of sugar are in one sports drink or soda, really makes an impact. Below, Lisa Kimmel, R.D., Manager of Being Well at Yale, discusses the dangers of hidden sugar, salt and fat to a guest.